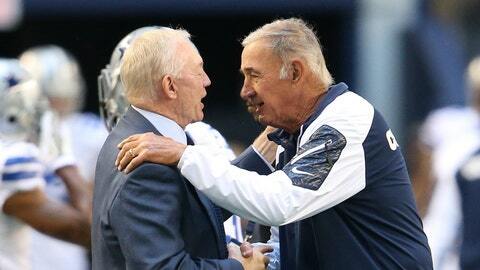 Dallas Cowboys defensive coordinator Monte Kiffin (right) talks with owner Jerry Jones prior to the game against the Minnesota Vikings at AT&T Stadium. Editor’s note: This is the second installment of Mosley’s 3-part series looking at the future of the Dallas Cowboys. Click here to read Part 1. In their bid to become the most consistently average team in NFL history, the Cowboys will need to continue down the same path. At some point this offseason, Jerry Jones will convince himself that he will never again suffer as many injuries to key players on defense as he did this season. He will remind himself that a defensive line of DeMarcus Ware, Jay Ratliff, Jason Hatcher, Anthony Spencer and talented reserve Tyrone Crawford looked pretty specialon paper heading into last season’s training camp. But trouble was brewing from the start when Spencer and Ratliff couldn’t participate in camp and Crawford suffered a season-ending surgery. Jones will look at how close the Cowboys came to defeating the Eagles in Week 17 and decide that massive changes aren’t needed. He’ll likely nudge Monte Kiffin into retirement, but there’s a decent chance he promotes defensive line coach Rod Marinelli to defensive coordinator. With this in mind, I reached out to the man most responsible for Jones hiring Kiffin and converting back to a 4-3 scheme last offseason. Larry Lacewell served as the Cowboys’ director of personnel until Bill Parcells decided the two couldn’t share a building. At some point in the coming weeks, it’s highly likely that Jones will call his old friend seeking advice. "I’m broken-hearted, frankly, over what happened this season," Lacewell told me by phone Friday. "Maybe the speed of the game was a little different than what [Kiffin] was used to early in the season. My stock isn’t real high at the moment [with Jerry]. I’m not on the hit parade." Still, Lacewell will have plenty of say in what direction Jones goes with this coaching staff. He thinks the continuity of keeping Marinelli is better than making sweeping changes to the defense. My take is that a younger coach such as the recently fired Jim Schwartz might bring some energy. Everyone wanted to talk about how Kiffin was amazing for his age, but it seems impossible to sell his return to a frustrated fan base. I thought Lacewell’s most interesting thoughts involved the offensive side of the ball. He observed a completely different approach in the season-ending loss to the Eagles. "I’d do whatever they did in that game," said Lacewell. "I’m a Romo guy, but you could tell earlier in the season that everything was about making him happier by running a two-minute offense a lot of the time. But they put in a pretty good ol’ quarterback and played pretty damn good against the Eagles." That resonated with me because it’s obvious that Jones has created a situation where Jason Garrett basically reports to Romo. In that embarrassing second-half collapse against the Packers, Garrett sounded more like an innocent bystander than a head coach after the game. It seemed like Garrett and his offensive assistants were reluctant to take any options away from Romo, even if doing so might have been better for the team. It’s been suggested that Jones might consider bringing back Norv Turner as offensive coordinator. I think it would be an excellent move, but Garrett should have final say on that matter. If he thinks it would be strange to have his former position coach serve under him, then he should go in another direction. But surely he realizes that having Turner work directly with Romo might pay dividends. "I think it would be a great hire," Lacewell said. "Norv would be the person to quieten the ship and get things moving in the right direction. You have too many spoons in the pie right now." It should be a fascinating offseason for the Cowboys. But beware of the Eagles winning a couple playoff games. All it would do is reinforce Jerry’s belief that the Cowboys are closer to breaking through than they really are. Meanwhile, he can take solace in the fact that AT&T Stadium hosts every big event outside of NFL playoff games.